The piece below was written for and posted on the Green Building Advisor. I thought I’d share it here too. We like to measure how we’re doing in as many ways as possible. Like other businesses, we have a collection of metrics for financial tracking: profit and loss, budget projections and actuals, job costing of each project, value of our several funds (pension, equity, and reserves) and more. We also measure social factors: employee education costs, compensation ratio top to bottom, length of employee tenure, average employee age, charitable contributions, and community service. We consistently track (measure) our work backlog to help us plan for our immediate future. We try to predict our longer-term future, too – through strategic planning, creating five year plans, projecting organizational charts, and making succession plans. In design and project planning, we do extensive measuring (space planning, engineering) to ensure good building performance, structure, and utility. On our completed projects, we monitor energy use and other factors (like relative humidity) to help us learn what works and what doesn’t. And, of course, building itself is a process of constant measurement. 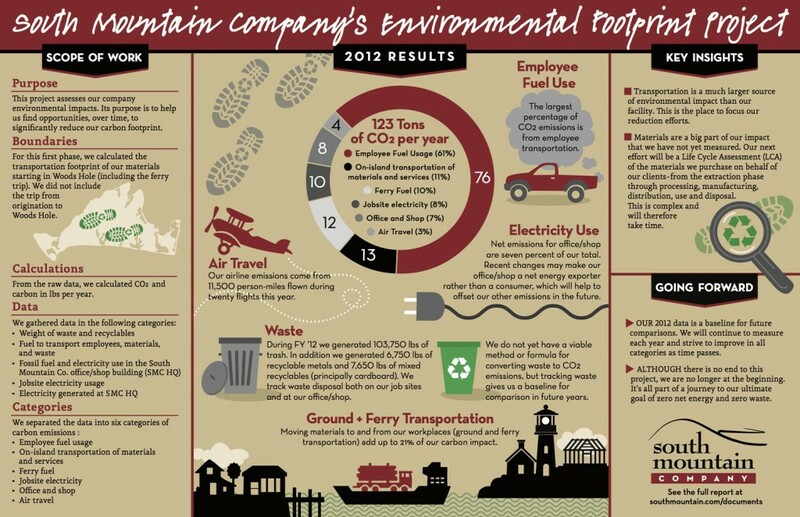 This desire – to measure whatever we can as a means of understanding who we are and what we do – inspired us, recently, to attempt to measure our company carbon footprint. Despite our efforts to build durable, high performance buildings with low environmental impacts, we recognize that all of our buildings have significant impacts, as do our operations as a company. We asked ourselves this question, “While we are working so hard to make zero energy buildings, how are we doing with energy and waste in our company operations?” The answer, despite our consistent anecdotal efforts, is that we had no real idea, so we set out to find out – to learn where our impacts are greatest, and where the opportunities exist to reduce those impacts. By gathering baseline data and measuring impacts, we would create a means to track our progress. When we first imagined this project, we assumed we would find models and templates. Surprisingly, we were unable to find small companies that are currently measuring their company carbon footprint (we still think they must be out there; we just haven’t found them yet). So we developed a methodology, gathered the data, and produced the first phase of our carbon footprint assessment. Our director of engineering, Marc Rosenbaum, was largely responsible for the methodology. My daughter Sophie, who works with us part time while she is working on an MBA in Managing for Sustainability, collected the data from various places and was the primary author of the report. We have now completed the first phase. Here’s a snapshot that shows that by far the largest source of energy use in our company at present is employees getting to and from work and driving around (hopefully not aimlessly) doing errands during the day! We recently completed a project to make our offices, shop, and storage facilities net energy producers. 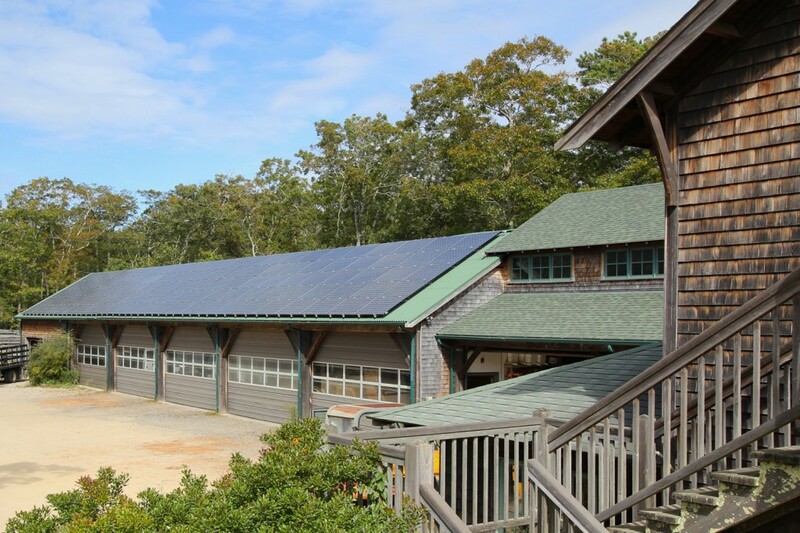 We added a large solar array and replaced our oil heating with air source heat pumps. (But since we enrolled in the MA Solar Renewable Energy Certificate program, which enables us to sell the renewable attribute of the solar-generated electricity, we can’t count it against the electricity we use – that would be counting it twice in carbon footprint terms). • Acquiring an SMCo company electric vehicle for office errands and short trips during the workday. We’re particularly jazzed about the electric vehicle, as we have been working to make our facility more resilient in case of an event that leaves us without power for an extended time. The battery pack in an electric vehicle represents energy storage that can supply our facility with power during an outage. It’s likely that we’ll need more storage than one vehicle battery pack provides, so we can use our PV array for back-up power. We are also ready to begin the second phase of our assessment, which is the complicated part. The materials that we use in our projects are a big part of our impact. In the first phase we only measured their transportation from Woods Hole (the other side of the water from the Vineyard, our home territory) to their destination, and the waste they generated. But that leaves out, of course, a big part – the materials impact from origin to Woods Hole. For simplicity’s sake, we decided, for phase one, that this is part of our clients’ carbon footprint, not ours – a convenient deflection. A procrastination, in fact (like washing all the dishes and leaving the baking pans and skillets in the sink to soak) but one that was necessary to allow the analysis to be phased. Ultimately, however, we understand that these materials are, indeed, a part of our impact. More important than who is assigned the impact is the fact that we are the ones that can assess and change practices, so the ball’s in our court. The second phase, which we are beginning now, is to dig deeply into Life Cycle Assessment (LCA) of the materials we purchase for our projects – from the extraction phase through processing, manufacturing, and distribution (along with the current local transportation and waste disposal that we are already tracking). This new part of the endeavor requires extensive research and new learning. It also means we must consider and interact with our supply chain in new ways – to try to create alignments, in both values and practices – with our suppliers. This is bound to be a long haul. In summary, for 20 years or more we have had the goal of reducing carbon emissions, but it has been an abstract goal to which we have only given episodic attention. It may take another 20 years to reach our zero energy and zero waste goals, and we are only beginning to learn how to do that. But this first phase of our Carbon Footprint Project has served its intended purposes. We identified the areas in which we are already doing well, found the areas that are most ripe for improvement, and specified the aspects which need further inquiry. There’s always something new that needs to be measured. Numbers tell stories. Stories teach. This metric feels like one that will be teaching us a lot – for a very long time. While there will be no end to this project, we are no longer at the beginning. It’s part of a path to a restorative future. The full first phase report is available on the SMCo website at http://www.southmountain.com/documents. We are interested in feedback about ways to improve it. We are also interested in knowing about other companies doing this work. I’ll keep you posted as we change our practices to reduce our footprint and make progress on Phase Two. Don’t hold your breath!